Lew Alberts (Albert Morton Kurzman) was born December 13, 1880. The son of Jewish immigrants, he lived in both Brooklyn and Manhattan. When he was a teenager his parents sent him to a technical high school where he studied drawing and metalwork. One of the tattoo stories about Alberts that was told for years was that he was a wallpaper designer before he was a flash artist. We’ve come to find out that it’s true; after technical high school he did design wallpaper. Alberts enlisted in the Army in 1899 and fought during the Spanish-American War in the Philippines. It is said that he was tattooed while in the military and also learned the art of tattoo while there. 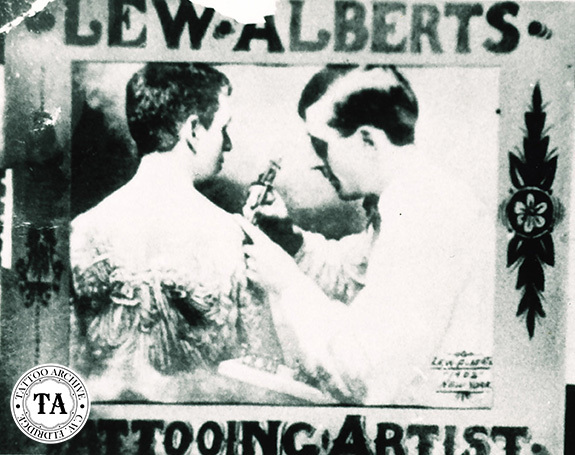 Tattoo legend has it that after the military Alberts was appalled by the lack of quality in tattoo designs and upon his return to the States he settled in the Chatham Square area of New York City where he began to redesign tattoo flash. As with many influential characters in tattooing there are contradicting stories about their lives. Bert Grimm had a different version of the story about Alberts and his redesigned tattoo flash. Bert’s story goes that Lew Alberts came through Portland, Oregon after he got out of the service and caught Charlie Western on a drunken spree. Alberts bought up all of Western's flash, took it back to New York City and sold the designs as his own. The true version of this story may never be known!. By this time Alberts was professionally known as "Lew the Jew." He worked for several years with Charlie Wagner at Chatham Square and may have used Wagner's supply business as an outlet for his flash. As with many tattooists from this era, on their business cards they offered machines, pigments, needles, etc. Alberts also sold his wares through advertisements in publications like Police Gazette but with that said there is no record of Alberts forming a supply business. Alberts moved around a bit before settling in Brooklyn, New York at #87 Sand Street. After World War I his competition became too much with Jack Red Cloud, Bill Donnelly and Jim Wilson all within a short distance of each other in Brooklyn. In the late 1920s he moved his shop to his home in Newark, New Jersey and semi-retired. Lew Alberts died October 8th 1954.